We initially thought this would be a short one, but as you can see, we were wrong. For some reason that we haven’t been able to identify why this block of Granville Street was photographed quite often. While we often dig around – and often fail – to find images to show some locations, we have no problems like that with this block. 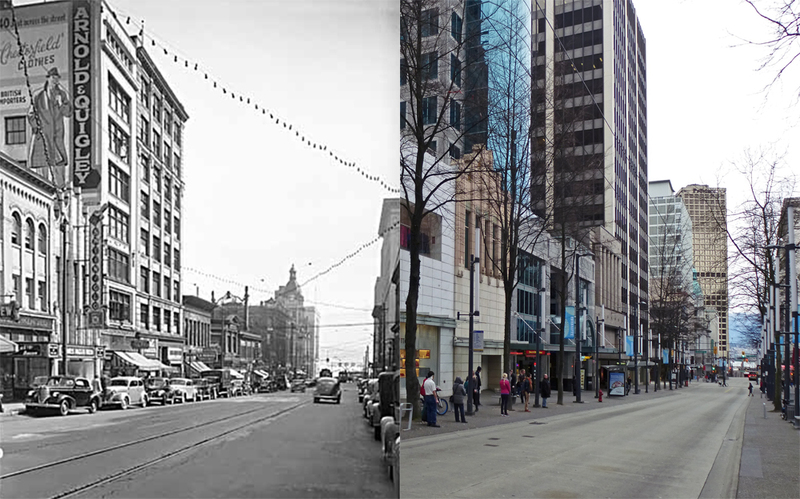 So here are two more images, the Archives shot above from 1934, and the Vancouver Public library shot below from 1940. Almost all the buildings have been referenced in the previous two posts, and earlier posts on the Bower Building and the Leigh Spencer block. The one building we haven’t referenced before is the small and slightly classical building close to the photographer, across the lane from the railway offices. The Building permits tell us that the building was designed in 1902 by W T Dalton for E Lewis, with Mr Horrobin as the builder of the $20,000 project.We think E Lewis was someone known in the city as Edward Lewis who developed at least three buildings in the early 1900s, all designed by Dalton, including the Bank of Nova Scotia that is still standing on West Hastings Street. In 1903 the Granville Street building was in use as the Customs Examining Office, (the insurance map calls it the Customs Postal Package Office). That would be connected to the location of the Post Office and Customs Office of the day – next door. That use was only to last until 1905. In 1906 it was identified in the Street directory as the offices of ‘Dominion Express’. The Dominion Express Company was a delivery division of the Canadian Pacific Railway. Express delivery rates were quoted from Victoria, Vancouver, and New Westminster. In 1926, the name of the company was changed to the Canadian Pacific Express Company. In 1903 the offices of the Dominion Express were on Hastings Street, in the same block as the Wells Fargo Express offices (also developed by Edward Lewis and designed by Dalton & Eveleigh). By 1935 when the picture was taken the building was the home of the Mutual Relief Life Insurance Co.
We hadn’t come across Mr Lewis before, but fortunately the excellent blog West End Vancouver has researched Edward in detail. They tell us that Edward was really Albert Edward, who had been active in real estate in Montreal before he arrived in Vancouver. He may have been born in Quebec – or possibly Wales. He was born in 1860 and as a young man is said to have travelled to New Zealand, several south sea islands as well as to China and Japan. He was a cattle rancher in Oregon and maybe in Washington. On returning to Montreal in the 1880s he married Helen Bagg, daughter of a wealthy real estate investor. The blog tells us he became a successful real estate dealer in his own name – until “this happy life seems to have had a darker side. One evening in late November 1897, Albert told Helen that he was going to meet a man on business, but he didn’t return that night. Not far away from his house, people found his hat and gloves, along with evidence of a struggle. The police sent out a notice, offering a reward of one thousand dollars “for his recovery.” After several days, there were reports of Edward having appeared in New York City, seemingly unharmed, but no details were forthcoming. According to a newspaper story that found its way into the Marion, Ohio, Daily Star, Edward had been leading a double life. Although in many ways he was a model husband, he had been carrying on a series of affairs with women in Montreal. One of the Montreal women was married, and her husband was threatening to shoot Edward. As well, the woman from his premarital relationship began demanding money, which he paid at first, but after he stopped paying, she threatened to expose him. By 1901 Helen and Edward (as he now preferred to be known) had apparently got over his past indiscretions and settled in Vancouver. They’re listed in the 1901 census, and were living on Haro Street from around 1900, and it seems that Edward went on a trip to Shanghai before this. He may have been in the area previously – an Edward Lewis took a steamer from Victoria to San Francisco in 1899 in the company of Captain Van Braemer. In 1901 Edward and Helen had a Scottish domestic, Mary McGillivray living with them, and from 1902 to 1906 they’re shown living at 1960 Robson Street. Interestingly (and probably not coincidentally) W T Dalton lived next door at 1972 Robson. The couple travelled quite often, sometimes to Europe, and after several reports of ill-health, the Daily World of June 29 1908 reported “The death occurred on Monday in Paris, France, of Mr. Edward Lewis, well-known in society and business circles in this city. Mrs Lewis was with her husband when he passed away. The deceased came here a number of years ago from Montreal, where he had been in business. He soon became one of the largest property holders in Vancouver, being the owner of some of the best locations in the business districts. The news of his death will be deeply regretted in Vancouver, where his hospitality and other good qualities made him a large number of friends.” The Times Colonist had the same story, and rehearsed his earlier Montreal ‘disappearance’. Burial records show Edward was buried in the family plot in Caerwys, Flintshire,Wales. His widow arranged for a large stained glass window to be installed in Christ Church in Vancouver to memorialize him. In 1911 she remarried to Herbert Charles Drummond. There’s a puzzling entry in the 1911 Census. Someone called Edward Lewis is shown living at 1960 Robson Street, aged 46, born in England. The Street Directory doesn’t identify anyone called Edward Lewis living at that address; S Quigley, a widow, is listed as living there in 1911 and Frances Grosvenor in 1912. 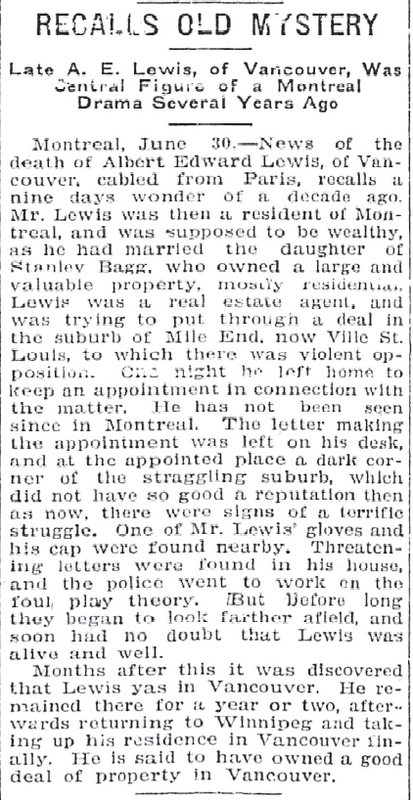 The most likely explanation is that this was not Mr Lewis mysteriously reincarnated, but actually Mrs Lewis – his widow. She re-married soon after the census was taken, but would still have been Mrs Lewis in June 1911. There are two young ladies, described as nieces, living there too – 19-year-old Mollie Fitzgibbon and 20-year-old Marjorie Lindsay. Mrs Lewis had a sister who married and became Mary Lindsay, and the Province in 1907 reported “Mr. and Mrs. Edward Lewis, accompanied by their niece, Miss Lindsey, will spend the month of April at the Riviera.” The household was completed by the Chinese domestic, recorded as ‘Wee Lamb’.